42km with maxon DC motors: NASA rover Opportunity has travelled the equivalent distance of a Marathon. After spending 11 years on Mars, what was originally planned as a three-month mission unfolded into an incredible success story – and not least for maxon motor, the Swiss drive specialist. It may not be setting any records for speed, but it certainly is for persistence: after 11 years and two months, the NASA rover Opportunity travelled a full marathon distance of 42.195km. Achieving this distance during a 46-meter leg on 24 March, 2015, this makes Opportunity the first vehicle to complete this distance on another planet. What’s even more astonishing is that the rover was originally designed for only three months of use. 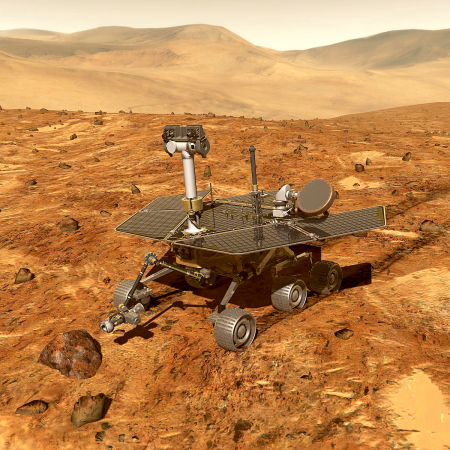 Opportunity’s six wheels are driven by 43 maxon DC motors: 35 units with diameters of 20 and 25 millimeters for the rover and another eight motors for the lander. The quality and performance of the motors speak for themselves: the DC motors in the wheels did more than 78 million revolutions each, under extreme environmental conditions and temperature fluctuations from -120 bis +25 degrees Celsius. The results of this successful project are being utilised in the development of new motors that will fly to Mars in the European ExoMars rover. For more information on the Mars missions involving maxon motors please visit our website www.maxonmotor.com.au or call 02 9457 7477.
maxon brushed and brushless DC motors in space again. The toughest servomotors for the toughest application. maxon DC motors help look for signs of life on the red planet, drive robots discovering lunar caves and travelling near to the sun. 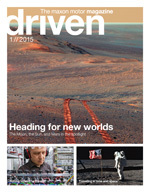 The amazing space exploration missions using the world’s toughest DC motors are detailed in the latest maxon motor magazine – driven. Slowly but surely mankind are uncovering the mysteries of the universe and maxon motors latest magazine edition is dedicated totally on space exploration and the associated technologies. The release this week coincidentally aligning with the restart of the large hadron collider. We reveal technologies to be used on the next Mars missions, the Google challenge race to the moon and the challenge of sending probes to the sun. Look inside maxon motors laboratory and see how it develops DC motors for use in outer space, see the next generation of technologies that will go to the International Space Station. Leading researchers and scientists write on the future exploration methods and how we would like to discover new worlds. Contact maxon motor Australia. Ph. +61 2 9457 7477 .